Buyer’s Guide. Things to consider when purchasing a wire stripper. If you work with electronics, you have a need to pull insulation off of different electric wirings. Doing this with your hands, teeth, or a pocket knife will almost certainly result in cuts, scrapes, and injuries. What you need is a tool that’s specifically designed to help do the work for you. The tool you’re looking for is a wire stripper. Wire strippers are designed to cleanly and accurately strip the insulation off of electric wires. These tools are equipped to handle a number of different sizes of wire, stripping them without any injury to yourself, or destruction to the wires themselves. Perhaps you’re looking for a top-notch self-adjusting wire stripper? If so, you might consider the IRWIN VISE-GRIP Self-Adjusting Wire Stripper. It’s designed to automatically accommodate wires between 10 and 24 AWG, allowing it to adequately cover the majority of wires you’ll work with in computers and other such devices. This stripper works by tightening against each individual wire, grasping it just tight enough so that it can strip insulation without fraying the wire itself. Equipped with a swivel knob, it’s capable of tightening firmly against wires under 20 AWG so that you can gain as much traction as you need. 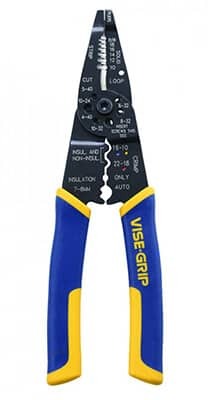 Like with the other IRWIN wire stripper on our list, this stripper possesses both a crimper and a cutter, allowing you to cover a number of different wire alteration tasks. 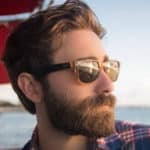 This tool is boldly marked with descriptions, allowing you to know exactly what you’re using it for at all times. Made out of hardened steel, it’s built to last, backed by a lifetime guarantee. Possessing a tacky, rubber grip, it’s easy to handle and utilize regardless of your hand strength. 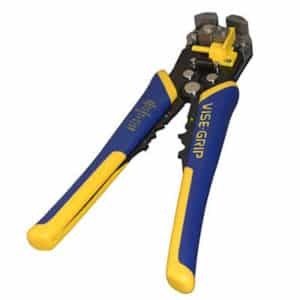 In essence, the IRWIN VISE-GRIP Self-Adjusting Wire Stripper provides you with everything needed to strip, cut, and crimp wires. Because it’s self-adjusting, it’s ridiculously easy to use, allowing users of all experience levels to thrive. Available for a mid-level price, it offers a tremendous amount of value. Perhaps you’re looking for a wire stripper that’s a little unconventional? 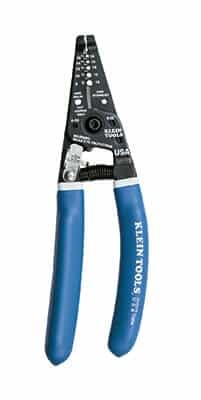 If so, you might consider the Klein Tools 11063W Katapult Wire Stripper. Capable of clamping and stripping insulation in one fell swoop. It’s ridiculously easy to operate. 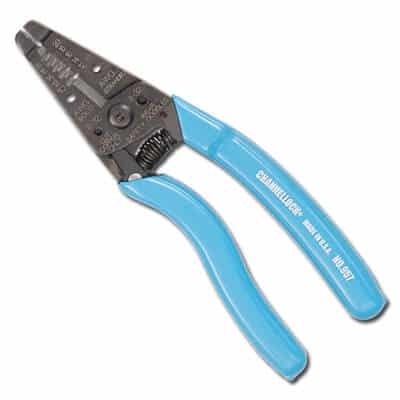 This wire cutter is designed to strip wires between 8 and 22 AWG. Unfortunately, it’s doesn’t possess a cutter or crimper. It is, however, capable of removing up to 1 inch of insulation with just one hand motion. Possessing endless durability, it’s made out of tough, hardened steel which is designed to withstand years and years of use. Equipped with a tacky, rubber grip, it’s fairly easy to handle regardless of your hand size. 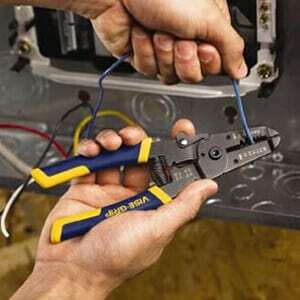 All in all, this Klein Tools wire stripper is a terrific stripper for those who value simplicity and ease of use. Though it’s a little on the expensive side, its outstanding functionality is well worth its price. 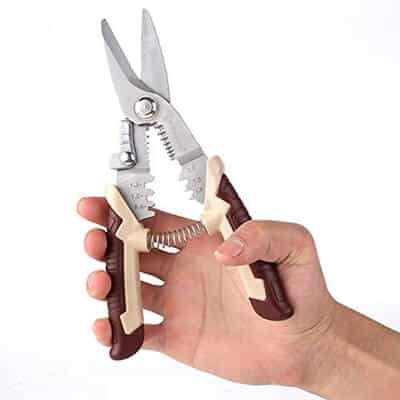 Maybe you’re looking for a self-adjusting wire stripper but don’t want to spend a lot of money? 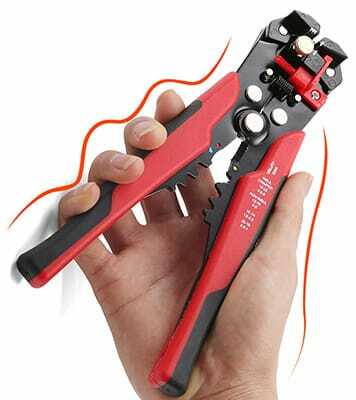 If so, the Neiko 01924A Ultimate Self-Adjusting Wire Stripper is just what you’re looking for. Equipped with high-quality stripping, cutting, and crimping abilities, it can easily cover all of your wire alteration needs. Capable of stripping wires between 10 and 24 AWG, it will handle just about every wire you find in computers or similar electronics. Spring-loaded, this tool automatically grasps wires at their specific widths, allowing for clean stripping. Its crimper can handle wire gauges between 10 and 22 AWG. Made out of heat-treated steel, this wire stripper is built to last. Equipped with a tacky, rubber grip, it’s easy to handle regardless of your hand size or strength. Marked with bold, descriptive text, it shows you exactly what each terminal is used for. You simply place the wire in the terminal you need, clamp it closed, pull, and let it do all the work for you. If you’re looking for an inexpensive self-adjusting wire stripper that simply gets the job done, the Neiko 01924A Ultimate is the wire stripper for you. It’s not quite on the level of high-end strippers, but serves its purposes just fine. While it can be used by users of all experience levels, it’s ideally used by people who only need to strip wire every once in awhile. If you’re looking for a wire stripper that can do a little bit of everything, you might be interested in the IRWIN VISE-GRIP Multi-Tool Wire Stripper. Capable of stripping, crimping, and cutting wires, this wire stripper can handle all of your wire-altering tasks. Possessing tough construction, it’s designed to last over years and years of use. First, let’s talk about this wire stripper’s stripping abilities. It’s equipped with cutting terminals from 10 to 22 AWG, allowing it to accommodate about a fourth of the total wire gauges. It’s designed to strip all wires you would find in computers or similar electronics. All of its stripping terminals are clearly indicated with bold descriptions directly on the tool itself, making it ridiculously easy to use. Equipped with a cutting section as well as a crimping section, it’s designed to make all wiring alterations as simple as possible. Made out of hardened steel, this stripper is constructed to stay sharp for long-term use. Equipped with a soft, tacky, rubber grip, it offers superb handle and control, allowing you to squeeze it tightly without fatiguing your hand. In summary, the IRWIN VISE-GRIP Multi-Tool Wire Stripper is a great all-purpose wire alteration tool for users of all experience levels. Its intuitive design and functionality allows for simple and seamless use. Available for a very reasonable price, it’s one of the best bargain wire cutters on the market today. Perhaps you’re working with smaller wires. If so, you need a wire stripper that’s designed to accommodate them. 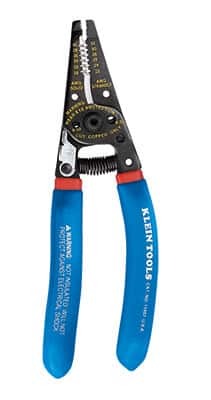 A good choice would be the Klein Tools 11057 Wire Stripper. A manual wire stripper, it’s very user intuitive, making it extremely easy to use. This wire stripper is capable of adequately stripping wires from 20 to 30 AWG. Also possessing a looper, and a cutter, this stripper has everything needed to get the job done. Marked with bold, white letters, it tells you exactly what each terminal is capable of, allowing you to use it with little to no confusion. Made out of hardened steel, it’s as tough and durable as any wire stripper you’re going to find. Equipped with a spring, it’s constructed so that it grasps firmly to whatever wire it’s stripping. For handle and control purposes, it possesses a tacky, rubber grip. It closes fairly easy, making it great for users of all hand sizes and strengths. If you’re looking for a simple wire stripper that can handle small gauges, the Klein Tools 11057 Wire Stripper is what you’re looking for. Not only can it strip wires, but cut, and loop them as well. Available for a mid-level price, this stripper offers a great deal of precision, accuracy, and functionality. Maybe you have a job in which you run into a lot of large wires. Maybe a typical 10-24 AWG wire stripper isn’t going to get the job done. 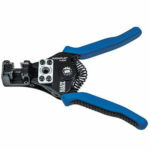 If so, you might consider purchasing the Klein Tools 11054 Wire Stripper. Capable of accommodating wire gauges between 8 and 16 AWG, it strips wires seamlessly, leaving no frays or tears, and also possesses a cutter which can shear 6-32 and 8-32 screws. Made out of hardened steel, it’s designed to withstand years and years of use. Its spring locks wires into place, ensuring that they are stripped with absolute precision and accuracy. Equipped with a rubber grip, they’re ridiculously easy to handle regardless of your hand size and strength. If you’re looking to strip wires that are on the larger side, this Klein wire stripper is the one for you. Available for a mid-level price, they offer quite a bit of value without forcing you to break the bank. While there are a lot of great wire strippers on the market today, we’re going to go with the OYISIYI Wire Stripper as the best one around. A self-adjusting stripper, it grasps wires firmly, stripping them clean of insulation with just a simple pull. This wire stripper is equipped to accommodate wire gauges between 10 and 22 AWG, making it great for most wire altering purposes. Also equipped with a cutter and a crimper, it’s adorned with bold, white letters to tell you exactly which terminal is appropriate for your specific purpose. 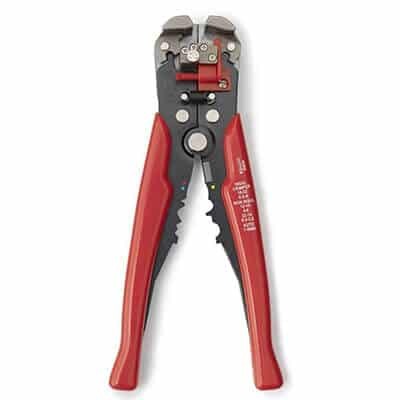 Made out of hardened stainless steel, this wire stripper is built to last and is covered by a 3-year replacement warranty. Equipped with an oversized rubber grip, it’s ridiculously easy to handle regardless of your hand size or overall coordination. To help it clamp firmly against your wire, it possesses a spring that stretches to meet the wire’s specific gauge size. 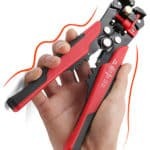 While it’s a bit more expensive than other wire cutters on our list, the OYISIYI Wire Stripper is well worth the price. No other wire stripper combines durability, grip, and functionality in the way that this one does. Whether you’re a professional electrician, or a hobbyist working on a project, it will accommodate you. Professionally-made, the Kinee Adjustable Automatic Cable Wire Stripper is capable of stripping a huge number of wires in a very short amount of time. Designed to strip everything from computer wire to automobile wire, to speaker wire, it performs its duty with very little put forth by its user. While this is primarily a wire stripper, it also possesses a cutting mechanism. However, unlike other strippers on our list, it doesn’t possess a crimping mechanism. Made out of tough plastics and metals, it’s designed to last over years of use. Though it’s not equipped with a handle, its textured surface is easy to grip and handle. If you’re looking for a simple, but effective wire stripper that gets the job done quickly, the Kinee Adjustable Automatic Cable Wire Stripper is exactly what you need. Great for electricians and technicians, it suits users of all experience levels. Available for a considerably low price, you’ll be hard-pressed to find another stripper that offers this much value on a budget. Some have a need to use a wire stripper for long periods of time. If this is you, you need something that provides superb comfort and handle. 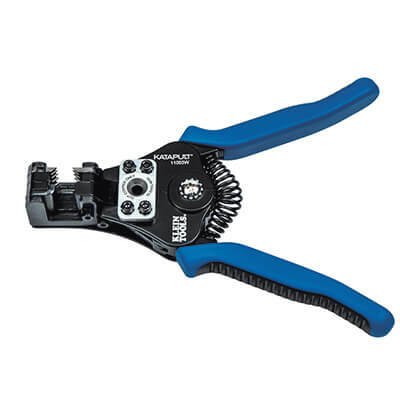 For this purpose, we suggest the Channellock 957 7-inch Ergonomic Handle Wire Stripping Tool. This wire stripper is designed to strip wires between 10 and 20 AWG. It’s also capable of crimping and cutting wire. To make it user-intuitive, it’s adorned with bold, white descriptive letters. Made out of durable, hardened steel, this wire cutter is capable of withstanding quite a bit of wear and tear. Equipped with a tacky, rubber grip, and designed with an ergonomic handle, it’s ridiculously easy to handle for users of all strengths and hand sizes. It fatigues your hand as little as any wire cutter you’re going to find. 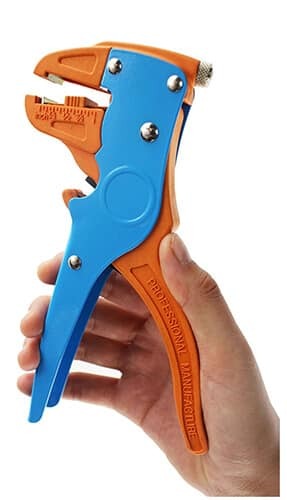 If you’re susceptible to hand fatigue, or if you have a need to use a wire stripper for long periods of time, this Channellock stripper is the stripper for you. Available for a relatively low price, it offers a great deal of value. Looking for a high-quality wire stripper at a budget price? 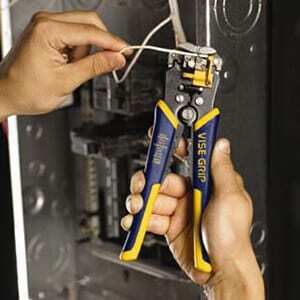 If so, the MVPower Multi-Tool Wire Stripper is just what you’re looking for. Though inexpensive, it possesses a stripper, cutter, and crimper to accommodate all of your wire alteration needs. This wire stripper is capable of stripping wire gauges between 10 and 22 AWG. Equipped with a spring, it closes firmly against each wire you strip, ensuring that it removes insulation with accuracy and precision. Made out of hardened, heated steel, it is capable of withstanding quite a bit of wear and tear. Possessing a fairly ergonomic handle, it sports a tacky, rubber grip for the ultimate handle. Regardless of your hand size and strength, you should be able to use this stripper consistently. If you’re looking for a solid wire stripper just to have on hand, this MVPower stripper is the one you’re looking for. It provides fantastic stripping, crimping, and cutting capabilities, and at a low price. While all wire strippers look the same from a distance, they are all actually quite different once you begin using them. There are a number of things which separate each individual wire stripper. In order to choose the right wire stripper for you, you must take these things into consideration. They include overall construction, grip, number and size of cutting terminals, and its overall ease of use. As with any product you purchase, you must consider a wire stripper’s overall quality and construction. Most wire strippers are made out of hardened metals such as steel or titanium. They typically possess rubber grips which allow for maximum handle and control. In order to use a wire stripper, you need to be able to hold it with great stability. This requires that you can give it a nice firm grip. Some wire strippers possess rubber grips which allow for ultimate traction and handle, while others don’t possess tacky grips at all. Read online reviews to get an understanding of the grip your desired wire stripper provides. A good wire stripper possesses a number of different AWG cutting terminals. AWG stands for American Wire Gauge. Each different wire you could possibly strip possesses an AWG of somewhere between 0 and 40. Wire strippers are equipped with cutting terminals which are specifically equipped to pull wires of different AWGs. Ensure that the stripper you purchase is equipped to handle the specific wire you wish to pull. Some wire strippers can seamlessly secure themselves around wires, allowing them to strip these wires both quickly and without much effort. Other wire strippers are less functional and accurate, making them more difficult to use. In order to get an idea as to the functionality of a wire stripper, make sure to read some online user reviews before purchase. Wire strippers are aptly named in that they’re tools used to strip the insulation off of electrical wires. While there are other ways to remove insulation from wiring, a wire stripper is specifically designed to do so. These tools are a lot like pliers in that they’re squeezed together with your hand in order to grasp wires. However, they’re different in that they’re equipped with cutting terminals which are sized to accommodate specific wire gauges. Possessing specific wiring gauges allows wire strippers to strip insulation from electrical wires as precisely and as accurately as possible. This prevents you from accidentally cutting into the wire, damaging it, and rendering it useless. Insulation can be scraped away from electrical wiring in a number of ways. Each and every method that is used possesses its drawbacks and benefits. Using a wire stripper possesses several benefits over the other methods. Perhaps the most beneficial aspect of using a wire stripper is that it’s convenient. Many of the other methods involve using electricity, heat, or chemicals to burn the insulation away. This can not only be costly, but time-consuming as well. A handheld wire stripper allows you to shave off insulation in a rapid and cost-effective manner. This makes it especially useful for those who need to strip wire rather frequently. You can simply place the wire in your wire stripper’s appropriate cutting terminal, and get the job done without much worry. Working with electronics requires precision, accuracy, and a steady hand. There are a number of different wires which much be perfectly placed in order for an electrical object to operate properly. In order to place these wires with precision and accuracy, they must be cut and trimmed to size. Perhaps the most tedious part of working with electrical wiring is stripping it of its insulation. Fortunately, with a wire stripper, this problem is eradicated. A wire stripper will strip a wire’s insulation with complete accuracy and precision, allowing it to be used the way it’s supposed to be used. There’s no need to strip wires with knives and teeth. A wire stripper will perform the job as quickly and as effortlessly as possible.